"The syllables/sounds “Ta” and “Dhom” symbolizes the idea of two worlds, two ideas, and two cultures. Classical Music and Hip Hop are representative of this very concept of -“THE TWO WORLDS”, and yet the harmony that lies hidden between their duality. One will almost always find a connection between two different worlds though, by digging slightly deeper, and sometimes, by unlearning a thing or two." "The Ta Dhom Project has now, in our humble opinion, reached a point where we are able to share some of our discoveries. 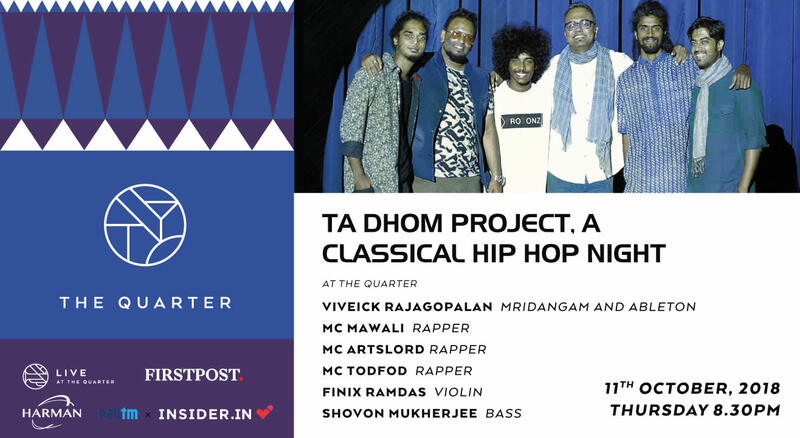 We believe we have created a sub-text in the Hip Hop Culture, and added an Indian twist to it. Something, we believe, has not been done before. To complete the circle, we used the Mridangam and Kanjira to create a foundation of grooves / beats. We believe this has allowed us to keep the ethnicity of the sound, raw, bold, and intact." The Quarter is celebrating world Pizza and Beer Week from the 10th of October to 18th October! Expect some delicious, fresh pizza and lots of beer to go with it 😉🍕🍺 We have a host of exciting packages, so come over, relish and relax! Call on +918329110638 or +919326866986 for bookings!